I want to implement a Momentum Strategy, followed by Jegadeesh and Titman (1993) with overlapping Portfolios. I want to duplicate their results. First of all: I work with discrete monthly Returns. But I don't know which returns I have to calculate to implement my Momentum Strategy properly. In this case I have a composite Portfolio consisting of the Portfolio initiated in JAN (Tranche 1), a Portfolio initiated in FEB (Tranche 2, hold for 2 Periods) and the portfolio initiated in MAR (Tranche 3, hold for 1 Period). What Returns do I have to calculate now to duplicate the Method of Jegadeesh and Titman (1993)? My attempt would be: In March, I calculate the Return of Tranche 1. This Portfolio was acutally held for 3 Months and so we liquidate it and measure it's Return with the Geometric Mean (Because I have discrete Returns). This is the first observation of my Strategy. But I can also calculate the Return of the composite Portfolio (vertical aggregation) for the month March. I calculate the Return of the composite Portfolio (Consisting 3 Sub-Portfolios) in March and divide it by 3 (Arimethic Mean) so that I have the average Returns of all 3 Sub-Portfolios for the Month March in my Composite Portfolio. This results in having for March 2 Observations, the Return of my liquidated Sub-Portfolio and the Return of my Composite Portfolio for the Month. In April I have the monthly Return of Tranche 2 and the composite Portfolio (Consisting Tranche2, 3 and the new Tranche 1). For every Month I sum up these two observations and take the Mean. This continues every Month. At the end I sum every Return of each Month up and take the mean of that to have the Monthly Returns of my actual Strategy. Is this the proper way to calculate the Returns of a Momentum Strategy? Or do I just calculate composite Portfolio Returns? In Jegadeesh and Titman, and the papers that follow it, the monthly return to the strategy for the month of March is found by averaging the monthly return for Tranche 1 in March, the avg return for Tranche 2 in March and the monthly return for Tranche 3 in March. 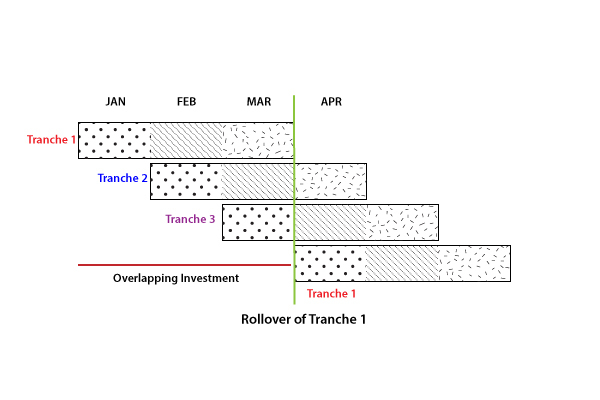 As shown in the diagram Tranche 1 consists of those stocks bought at the end of December and held in Jan, Feb, Mar and so on for the other tranches. This method is simple, though perhaps not completely realistic or not to everybody's taste (other methods of calculation are also possible). Not the answer you're looking for? Browse other questions tagged portfolio-selection strategy momentum or ask your own question.